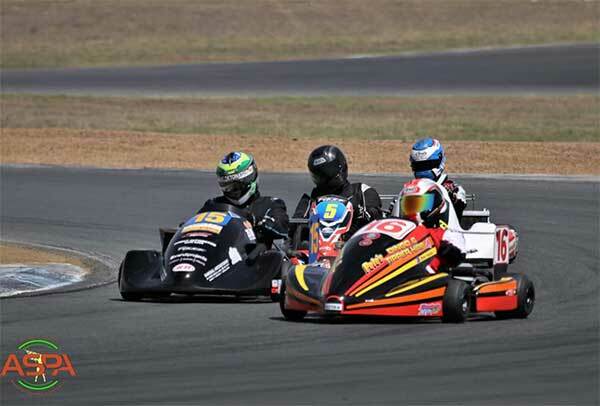 The Superkarts were back at Queensland Raceway for Round 5 of the 2018 Championship and there was a certain buzz in the air and spring in everyone’s step as they prepared for qualifying in beautiful QLD weather. Held over 2 days with 5 races there was plenty of action on and off the track as everyone swapped stories of what they could have, would have or should have done to win the last race. 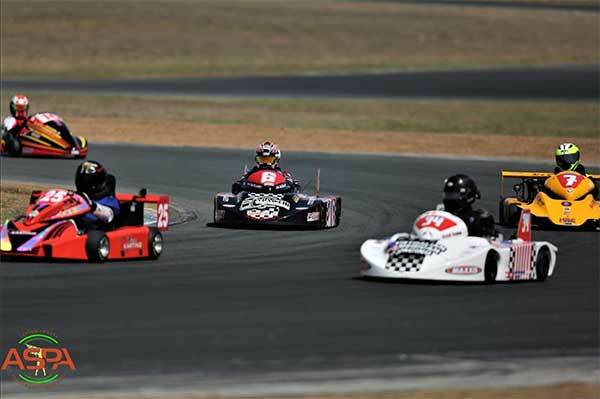 The red-hot favourite for pole was Russel Jamieson in his 250 International DEA powered Anderson kart but ignition issues would see him sidelined which left the 250 Nationals of Tim Weier, Lachlan and Gareth Crisp and Johnny La Spina to battle it out. 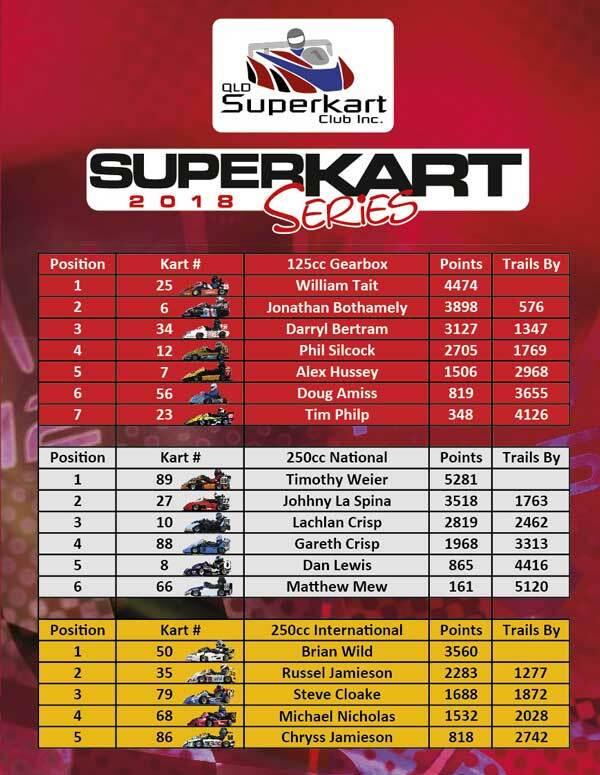 Johnny came into this round motivated after winning the last round, but it would be Tim who would edge Lachlan out of Pole by 0.1secs after clocking a 1:17.0 with Johnny another 1.1 seconds behind Lachlan, Gareth rounded out the top four 2.3 seconds behind Tim. Steve Cloake and Brian Wild were right behind them and things were tight in the 125 National class with Jon Bothamely edging out the class championship leader William Tait by 0.1 seconds. 3rd in the 125 Nationals was Fly in driver Tim Philp all the way from Perth with Darryl Bertram and Alex Hussey next. In TAG (Touch and Go) Aero it was on between old friends Nick Marshall and Peter Nuske with Pete just edging Nick by 0.1 on a 1:28:4 (I sense a common theme here) Leighton Cook and David Dyson would round out the TAG aero class. TAG Non-Aero would see Raymond Ralph and Ben Longland doing battle again. Ray would see himself mixing it with the Aero guys in his DD2 kart while Ben was having some carby issues that would see him a few seconds off the pace. Between qualifying and Race 1 all the TAG guys were busy trying to help Ben sort those issues. 85cc Gearbox was another tight contest with our top junior driver Bayley Douglas pipping Championship leader Scott Jamieson by you guessed it 0.1 seconds with a 1:29.7. Keith Taylor was 3rd with a 1:31.9 and Chryss Jamieson rounded out the top 4. Keith had some work to do to catch his main rival Scott for the championship. Class Championship Leader Brain Wild took full advantage of Russell’s ignition issues (turned out to be a loose screw on the rotor pick-up which they found Sunday morning in time for race 3) and grab the class win in race one behind the 250 Nationals of brothers Lachlan and Gareth Crisp. Steve Cloak would register a DNF after a major spin at turn 4 and Michael Nicholas didn’t get out after his engine sucked a crank seal in during qualifying. Steve would bounce back in Race 2 to grab the win from Brian. Once his ignition problems were sorted Russel set about turning in some quick laps to leave the rest of the field behind taking the next 3 race wins on Sunday. Brian again shows that consistency is just as important to win championships as outright pace coming home second in class in race 3 while Steve was a DNS after his kart failed to re-fire in the marshalling. Race 4 saw Brian beat Steve home again but in Race 5 Brian would drop a plug lead and had to limp home as a 125cc kart. After qualifying the 250 Nat guys were fired up. Tim Weier keen to capitalise on his his pole and rebuild his championship lead after a major engine failure at Rd4 while the Crisp’s and Johnny were also wanting to tighten their grip on the championship and stop Weier in his tracks. Race 1 got underway and Tim got the jump from Lachlan, but it wasn’t long before Lachlan found a way past, Tim was chasing hard before he had a coolant leak due to a broken hose clamp that would see him DNF. Gareth and Johnny wouldn’t be able to catch Lachlan for the win with the Johnny battling hard with Brian Wild all race. Race 2 and starting off the front row were the Crisp brothers, an untidy start saw the field bunch up into turn 1 and as a result saw a 6 way drag race down to turn 3 and exiting this corner saw Lachlan leading Gareth from Johnny and Tim. As the race progressed Gareth tried to put a move on Lachlan at 4 coming unstuck and letting Tim past who would reel off some quick laps to catch Lachlan before putting a move on at turn 3 only to see Lachlan pass him back 2 laps later and the last lap at turn 4. to take the win. Gareth would recover from his moment to be 2 seconds behind Tim at the flag with Johnny coming home 4th. Race 3 and 4 had much the same flavour as race 2 with a 3-way fight at the front with Johnny just not quite able to get involved with the leaders. Gareth would snag the win in Race 3 from Tim and Lachlan while Tim managed to grab the win in Race 4 from Lachlan and Johnny. Gareth finished in 4th but back in the field after an engine mount support broke. He thought a wheel was coming off but a quick trip to the pits showed what the problem was and he went back out to get some points for the race. Race 5 saw Tim bolt early and was never headed. Lachlan and Gareth scrapped over 2nd place until Gareth spun on the last lap at turn 5 but recovered to finish in 4th. Lachlan went on to take 2nd with Johnny making the most of Gareth’s moment to pick up 3rd. This round would be crucial in setting up the fight for the championship and Jon Bothamely was doing everything right to catch William Tait. Race 1 would see Jon convert pole into a win beating William to the line by 0.2 with Darryl Bertram, Alex Hussey home in 3rd and 4th while Tim Philp had a spark plug failure to record a DNF. Race 2 saw Jon make a cracker start which turned out to be too good coping a 30 second time penalty dropping him to 4th overall with Timothy Philp leading home William from Darryl and Alex. Race 3 would see William Tait find some more speed to gap Jon in second with Alex still on the improve coming home 3rd after Darryl had a seize stopping him on track. Race 4 and William Tait jumped to the lead with Jon in hot pursuit. 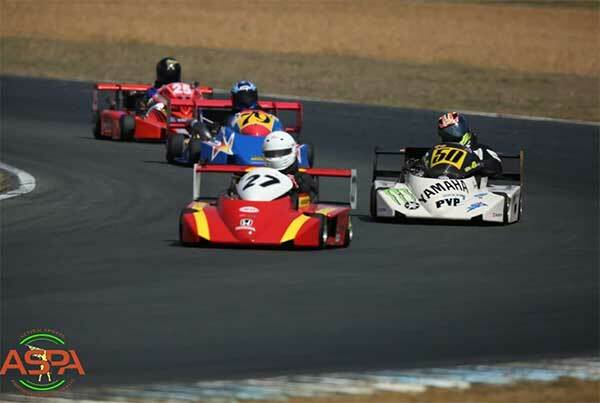 A mid-race clamp down (virtual safety car) to recover the karts of Peter Nuske and Scott Jamieson, who had come spun off together at turn 6, would just let everyone breath a little bit. Just over a lap later and the race was under way again and not long after this William Tait pulled over to the side of the track approaching turn 4 with a broken bolt requiring him to pull over onto the side of the track Jon took full advantage grabbing another race win with Alex home in second. Race 5 and it’s all to play for with William jumped to an early lead before Jon set about trying to reel him in, trading quick laps between them. Ultimately William would grab the win after Jon struck some traffic hampering his progress with Alex home in third place. The TAG guys also put on a great show and this weekend was no exception where every race saw them racing in a pack of 4 of more as well as some of the other classes getting involved as well. There were grins from ear to ear and plenty of stories being swapped between races, multiple passes every lap was not uncommon in this class. Peter Nuske continued his form of 2018 taking the first 3 race wins but he didn’t have it all his own way with Nick Marshall driving like a demon and pushing Peter all the way setting new PB’s along the way. David Dyson was having his best run to date finding some improvements over last time in his X30 powered Kosmic kart. Leighton Cook showed some impressive speed but would ultimately suffer a couple of DNF’s hampering his progress. In Race 4, Nick Marshall used the small mistake by Pete that saw him end up in the gravel trap at Turn 4 to take home his first round win of the year. These guys always like to try and stick it to the Aero guys using just standard sprint kart plastics rather than “big” aero noses. 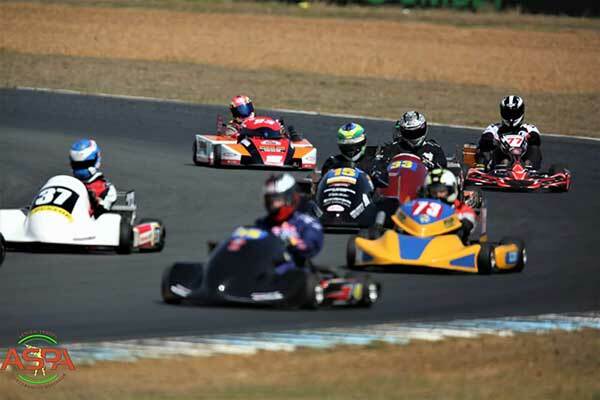 Raymond Ralph led the charge in his Rotax powered DD2 kart getting stuck into the fight with Peter, Nick and co. Unfortunately, Ben Longland hadn’t solved his carby issues which hampered his speed all weekend. Ray would manage to the beat the Aero guys in all 5 races and couldn’t be happier setting new PB’s during the weekend. Ray would also be Action Sports Photography Australia’s driver in Focus for round 5!! 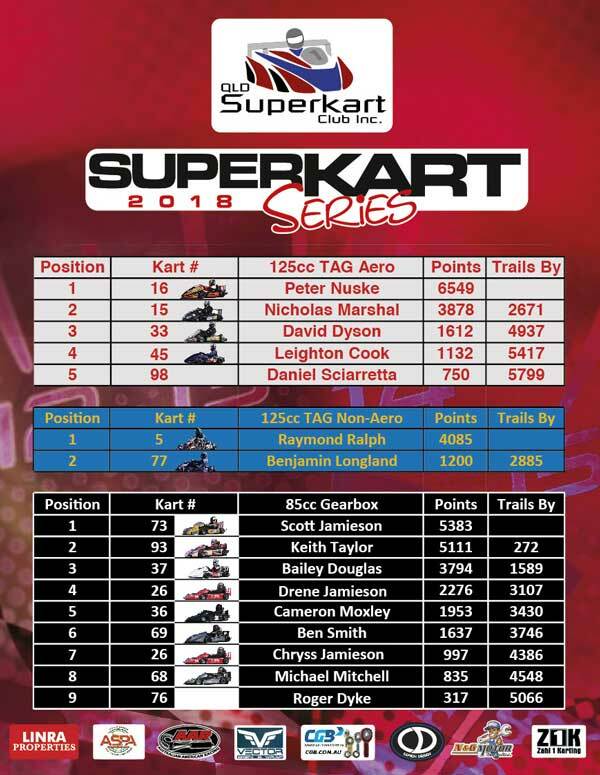 Round 6 will be interesting when the series heads back to the high-speed Lakeside Raceway, especially if Ray can continue his form and shake up the establishment in the Aero class. A few of the regulars missing this weekend but that didn’t stop the action. Bayley Douglas was enjoying the extra HP of the YZ Yamaha over his KX Kawasaki to mix it with the TAG guys and show the other 85cc guys why he was National Champion in sprint karting. Bayley would dominate all 5 races on the weekend with Scott Jamieson trying hard to catch him, Scott would also suffer a couple of engine related DNF’s during the weekend. Keith Taylor seemed to be lacking his usual speed and would use the DNF’s for Scott to keep himself in the title hunt only 272 points behind him heading into Rd 6. Chryss Jamieson had solid drives to pick up the pieces from Scott and hold off the challenge from Keith. Overall Results: 1st: Bayley Douglas 1348 Points 2nd: Chryss Jamieson 997 Points 3rd: Keith Taylor 819 Points. 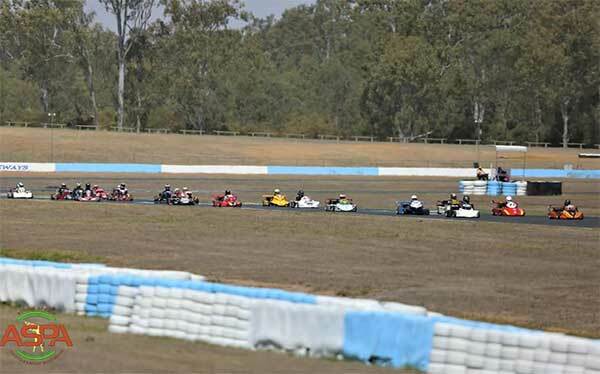 The 2018 Series concludes on the 17th and 18th of November at Lakeside Park Raceway still plenty to play for with most classes tight at the top particularly the 85cc Gearbox & 125cc National Titles.